New enterprise and consumer network technologies are coming fast and furious these days via well-heeled startups, and yes, even more established tech players. But further back in the pipeline, in the research labs of universities and colleges around the world, that's where the really cool stuff is happening. Take a peek at some of the more intriguing projects in areas ranging from wireless to security to open source to robotics and cloud computing. University at Buffalo and Northeastern University researchers are developing hardware and software to enable underwater telecommunications to catch up with over-the-air networks. This advancement could be a boon for search-and-rescue operations, tsunami detection, environmental monitoring and more. Their National Science Foundation-supported work is outlined in a study titled “Software-Defined Underwater Acoustic Networks: Toward a High-Rate Real-Tim Reconfigurable Modem” published in late 2015 in IEEE Communications Magazine. "The remarkable innovation and growth we've witnessed in land-based wireless communications has not yet occurred in underwater sensing networks, but we're starting to change that," says Dimitris Pados, PhD, Clifford C. Furnas Professor of Electrical Engineering in the School of Engineering and Applied Sciences at UB, a co-author of the study. Sound waves used underwater are just no match for the radio waves used in over-the-air communications, but the researchers are putting smart software-defined radio technology to work in combination with underwater acoustic modems. A ten-fold improvement could be had, if early testing is to be believed. 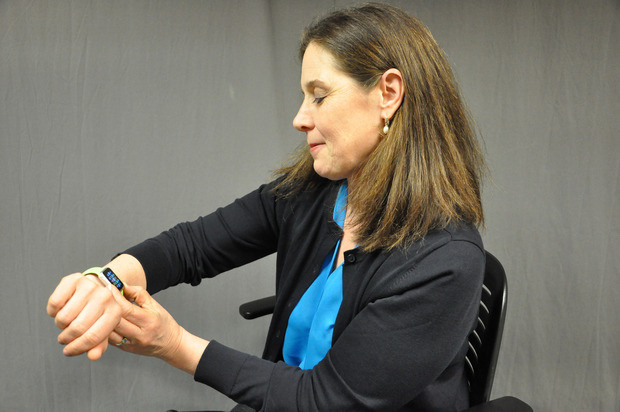 Penn State University Associate Professor of Educational Psychology Rayne Sperling is studying how students’ self-regulated learning can benefit from wearable and accessible technologies, such as the Apple Watch, that students can use both to create and consume content. "We will be using the Apple Watch as a new mechanism to provide academic scaffolds that target students’ monitoring of their learning and academic progress as well as specific strategies students can use as they learn course content,” Sperling says. Where were these Carnegie Mellon University researchers when Sister Thomas Catherine was frightening me and other good little Catholic school 3rd graders back in the day? A team of CMU researchers is taking aim at the $10 million grand prize of the $15 million Global Learning XPRIZE competition, the goal of which is to empower children to take control of their own learning via tablet computers, software and the like. The competition was announced in 2014 and entries are due by November. The researchers aren't actually trying to displace the good sisters and other teachers from their jobs, but rather, are looking to help educate kids in parts of the world where teachers and schools are hard to find. Among Mostow's claims to fame at CMU: His work on an automated Reading Tutor. Graphics processor units, which have been enabling video gaming consoles and computers to handle graphics-heavy apps for about 40 years, are the latest beneficiaries of open source. Researchers at Binghamton University say they have become the first to use an open-source GPU for research. Nyami is a synthesizable GPU architectural model for general-purpose and graphics-specific workloads, and could pave the way for other researchers to build their own GPUs, says Binghamton University computer science assistant professor Timothy Miller. 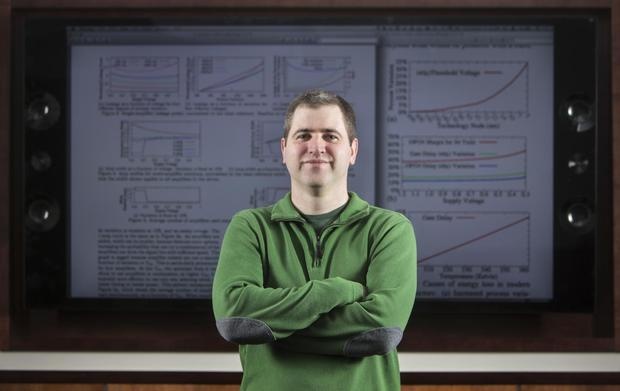 "As a researcher, it's important to have tools for realistically evaluating new ideas that may improve performance, energy efficiency, or other challenges in processor architecture," he says. There’s been a movement to test GPUs for dealing with more than just graphics, such as algorithms. While the cloud has plenty of economic and reliability benefits, performance guarantees can be a little more iffy. Computer science professors at Washington University in St. Louis have received a 3-year, $610,000 grant from the Office of Naval Research to study dynamic real-time virtualization and cloud computing, looking to make advances that could strengthen the cloud’s support for Internet-of-Things applications such as automobile safety and traffic signaling systems. More specifically, they’ll look to build a cloud computing platform that can manage and coordinate real-time virtual machines. overseeing – and served by – such industrial networks. Researchers at Iowa State University are building a cybersecurity testbed to help safeguard power grids. The PowerCyber laboratory is designed to do vulnerability analysis, risk assessment, attack-defense evaluations, and more. It’s complicated, given that we’re talking not just about communications networks and software, but also power lines, towers, sensors and other components. 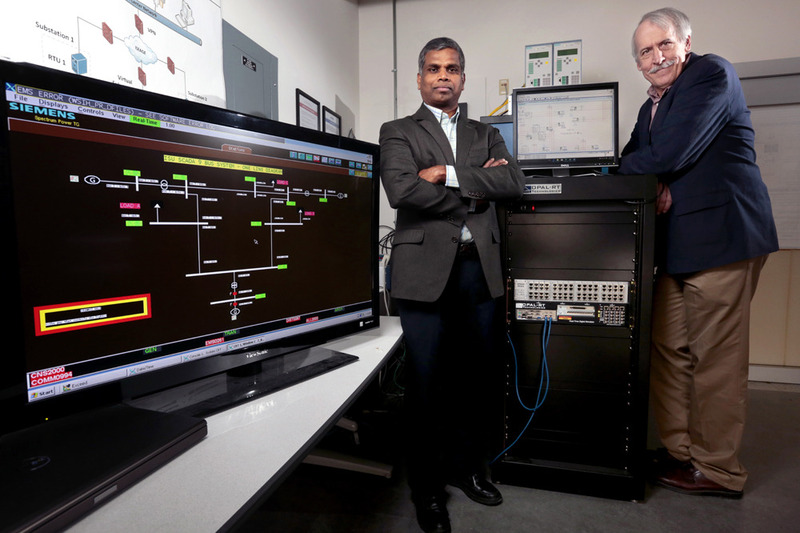 Iowa State's Manimaran Govindarasu and Doug Jacobson are leading studies of power grid cyber security, including development of the PowerCyber testbed. The NSF- and Department of Homeland Security-supported testbed, led by Iowa State’s Doug Jacobson and Manimaran Govindarasu, ties in with Jacobson’s time-tested ISEAGE network for cybersecurity studies. It’s being used for industry training and student studies, and also for cyber defense competition taking place in February. Engineers from UC Berkeley, MIT and the University of Colorado Boulder have joined forces to build the world’s first microprocessors that marry electrons and photons, paving the way for seriously faster computing and communications. What’s more, they did so in a foundry that mass produces more common computer chips, so the promise would be that such light-emitting chips could be made at commercial production rates, too. The researchers described their breakthrough in a paper published in the journal Nature in December. The researchers boasted that the energy-efficient chip had bandwidth density of 300Gbps per square millimeter, a 10 to 50 times improvement over standard microprocessors. This DARPA-backed research has already spawned a couple of startups targeting more energy-efficient data centers. Sometimes anonymous network technologies, such as Tor, aren’t quite as anonymous as users might like to think they are. MIT researchers, however, say they have invented a supposedly untraceable text-messaging system that comes with statistical guarantees of secrecy and that also works pretty fast. The researchers cheekily refer to their creation as Vuvuzela, after the loud plastic horns that became infamous during the 2010 FIFA World Cup in Safe Africa, in that it thwarts snoopers by creating noise on the network so that they can’t detect what’s being passed from one person to another. Vuvuzela source code is available here. Network World’s Tim Greene wrote in December that “The system uses encryption and a set of servers to conceal whether or not parties are participating in text-based conversations.” It doesn’t need to anonymize the actual participants in a conversation since “all the communications from clients to the servers are triple-wrapped in encryption,” he writes. Researchers have published a report that shows that email security goes a long way toward protecting passwords, financial data and more, but still isn't close to foolproof. One big problem is that the security protocols bolted on to the original Internet architecture aren't universally implemented on servers, even though big players like Google have adopted such methods (Note: Google worked on this study with researchers from the University of Michigan and University of Illinois.). Even advanced encryption can be corrupted. Bailey acknowledges: “I work under the assumption that any email I send without special care has an Internet-wide distribution list." 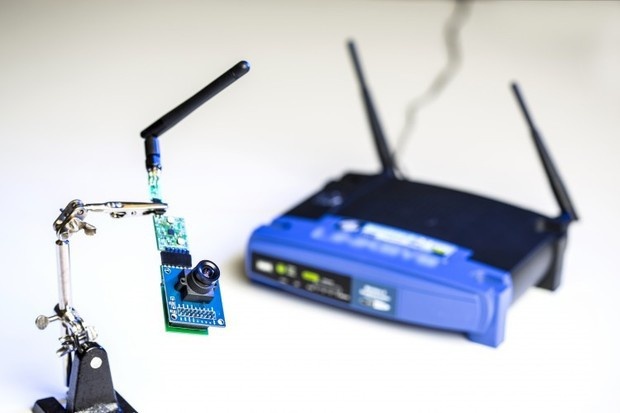 The UW team used ambient signals from this Wi-Fi router to power sensors in a low-resolution camera and other devices. University of Washington researchers don't appreciate Wi-Fi routers slacking off: The devices have enough untapped energy that they can be used to power devices in addition to connecting them. Their Power Over Wi-Fi system harvests energy from Wi-Fi signals to power Internet of Things devices such as temperature sensors, cameras and fitness trackers -- the kinds of things nobody wants to have to plug in to power up. Best of all, PoWiFi does this without messing with the quality of Wi-Fi communications. You can read the details in a paper titled "Powering the Next Billion Devices with Wi-Fi." Down the road, the researchers could look at enabling PoWi-Fi to work across greater distances and scale up to power many devices at once. The current research is funded by the NSF, Qualcomm and the University.